Nokia’s second Windows Phone, the Lumia 710, doesn’t have the impressive design of the Lumia 800, but comes at a noticeably lower price tag and promises the same rock solid Windows Phone experience. And now, it’s shipping to stores in select markets, but sadly this doesn’t yet include the US. The Lumia 710 will hit shelves in Taiwan today and within a week it’s set to arrive in Singapore, Hong Kong, India and Russia with a retail price of around $360 (270 euro). The second Nokia Windows Phone comes with almost identical hardware as the Lumia 800 - it has a 3.7-inch WVGA display, a 1.4GHz Qualcomm Snapdragon processor and 512MB of RAM. It does however offers plenty of color options with exchangeable back covers. If you’ve been waiting for Windows Phone stateside, good news is that the Nokia Lumia 710 is expected to land soon on T-Mobile as more and more leaked evidence suggests that. T-Mobile announced an event in New York next week that could bring us this exact smartphone, so stay tuned. Espoo, Finland - Nokia today announced the Nokia Lumia 710 will hit shelves, less than one month after the Nokia Lumia 800 started turning heads. The Nokia Lumia 710 will start selling today in Taiwan alongside the Nokia Lumia 800. 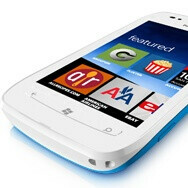 The Nokia Lumia 710 will then reach stores in Singapore, Hong Kong, India and Russia in the next seven days and continue its global roll-out over the coming weeks. Estimated retail price is 270 EUR, excluding taxes and subsidies and availability will be via operator partners, retailers and open channels depending on local situation. The colourful, affordable Nokia Lumia 710 was designed to make the Nokia Lumia experience accessible to more people around the world and at launch was widely praised as the best Windows Phone experience at is price point. It combines the powerful social and Internet experience of Windows Phone with the ability to take pictures in almost any conditions and share with friends in seconds, as well as access to thousands of the most popular apps, including exclusive Nokia services. People Hub in Windows Phone displays all call, text, email and social network interactions with any individual contact in an integrated view, with the ability to group contacts and pin favourite groups and individuals to the start screen for live updates and easy access to the people who matter most. Faster, easier Web browsing experience with Internet Explorer 9 and one-touch Bing search. Nokia Drive delivers a full-fledged personal navigation device (PND) with free, turn-by-turn navigation and dedicated in-car-user-interface. Nokia Music introduces MixRadio, a free, global, mobile music-streaming application that delivers 100s of channels of locally-relevant music. Nokia Lumia users will also gain the ability to create personalized channels from a global catalogue of millions of tracks. Also integrated in Nokia Music is Gigfinder, providing the ability to search for live local music for a complete end-to-end music experience and the ability to share discoveries on social networks and buy concert tickets. With the 5MP camera, anyone can take pictures and share on social networks in seconds, even when the phone is locked. The Nokia Lumia 710 can be personalized with a range of colours, including white and black front finish and a choice of five inter-changeable back-covers available to purchase separately. Also available to purchase separately are a range of complementary audio accessories co-designed and co-developed with Monster. The in-ear Nokia Purity Stereo Headset by Monster, providing high-performance in-ear style and the on-ear Nokia Purity HD Stereo Headset by Monster for the best mobile audio experience. Both products provide a fresh listening experience and are the first output of the exclusive long-term partnership between Nokia and Monster, intended to introduce a range of premium audio accessories to reflect the outstanding quality and bold style of the Lumia range. I still don't see why they couldn't have added an NFC chip, and then enable it when Windows Phone does support it. I mean some cheap Symbian phones have it, although not such a big deal. And it seems that the Nokia 701 is actually better than this in terms of design and build quality. The Lumia 710 is all plastic and a bit on the chubby side, while the 701 is slimmer and has more metal. It also has an IPS display(although lower resolution) which is much better than the plain old TFT of the 710. AND the 701 has better battery life, a ffc, a memory card slot... Sorry, but its obvious Nokia could have tried a little bit harder...especially since its one of their first Windows smartphones. Maybe they should lower the price to $300. It might be a normal TFT LCD but it still has ClearBlack technology, also battery life is better on Symbian phones in general than the rest. Don't forget that the 701 has a fixed focus camera.